NOTRE DAME, Ind. (CNS) — In 2015, the U.S. accepted 70,000 refugees that included one particular young family: a mother, a father and two small children. The family fled their homeland of Syria in 2012 and spent three years living in a refugee camp. During those years, surrounded by dismal conditions, the family underwent the rigorous scrutiny mandatory for those seeking refugee status in the United States, including security screening by the National Counterterrorism Center/Intelligence Community, the FBI, the Department of Homeland Security and the State Department. The story of this family was told by Cardinal-designate Joseph W. Tobin of Indianapolis, who spoke at the University of Notre Dame Oct. 14, less than one week after he was named a cardinal by Pope Francis. In the talk, “Welcoming the Stranger While Challenging the Fear,” the cardinal-designate discussed the history and current state of refugee resettlement in the United States, emphasizing the moral imperative that Americans welcome these neighbors as human beings and combat the prevalent fear, anxiety and hostility shown particularly toward individuals from the Middle East. This family whose story the cardinal-designate told was scheduled, he said, to be welcomed by Catholic Charities of Indianapolis last October. But after Indiana Gov. Mike Pence’s statement of Nov. 16, 2015, that he would prevent refugees from settling in Indiana until the federal government could ensure property security measures were in place, the cardinal-designate was asked by the governor not to permit resettlement. Cardinal-designate Tobin said the governor invited him to “pray and seek God’s guidance, which I gladly did.” The family was welcomed by the diocese and Catholic Charities and is now living in Indianapolis. Another factor contributing to such fear, he said, is what he termed “boundary maintenance” or a reaction to globalization that generates fear of the other. 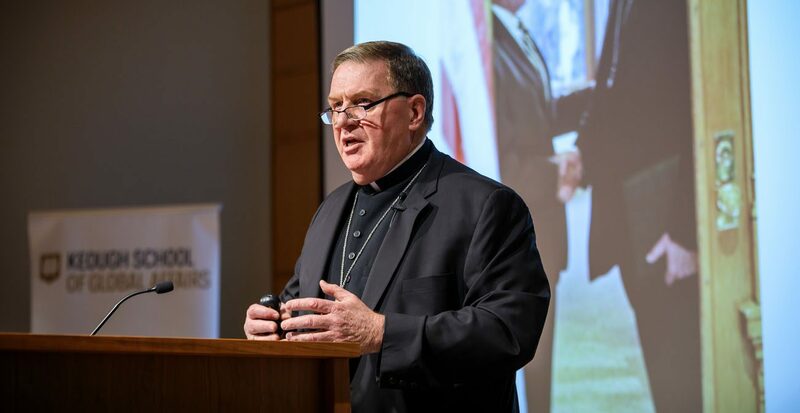 Cardinal-designate Tobin stressed that the federal government is responsible for immigration and refugee admissions to the United States and that governors ought to welcome refugees: “We need to encourage governors to continue to play their important welcoming role,” he said. He also encouraged the audience to reach out to a local refugee resettlement agency, saying the work at Catholic Charities would be impossible without volunteers. Gettinger is on the staff of Today’s Catholic, newspaper of the Diocese of Fort Wayne-South Bend.